This mod aims to overhaul Terraria by adding RPG elements, and includes a leveling system, an item upgrade system, an elemental damage system, procedurally generated weapons, and much more. For more detailed information, see the wiki. 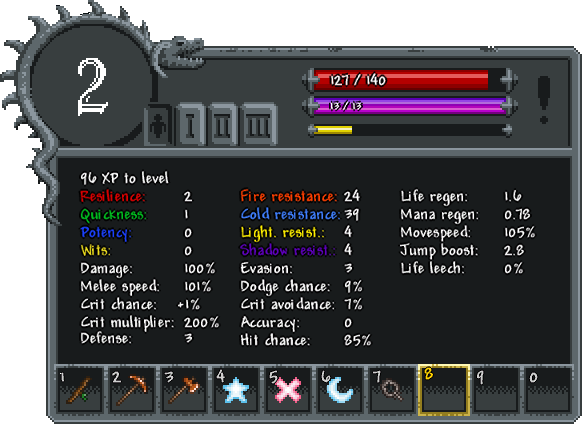 The mod features a leveling system with XP and level display, and rewards you with stat points when leveling up. In order to compensate for gradually increasing player strength, enemies have seen a drastic power increase, especially later in the game. To further emphasize these changes, I have added prefixes to armour and overhauled accessory prefixes to provide these new stats, including accuracy, leech, critical strike damage multiplier, evasion, and more. 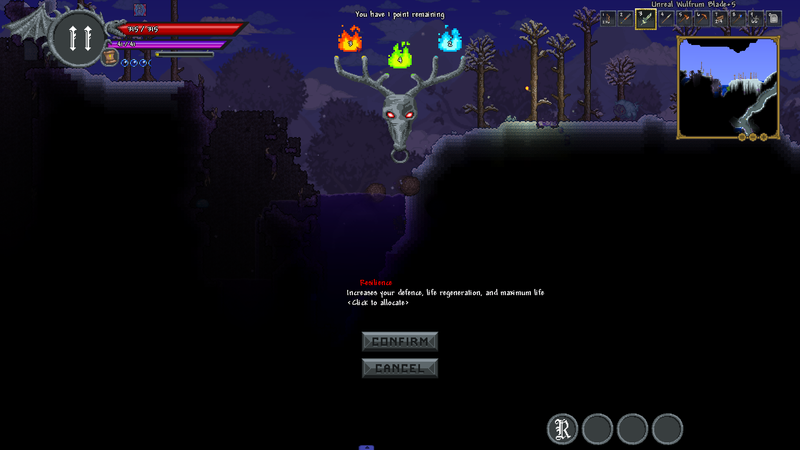 Enemies drop weapons, many of which are procedurally generated. To compensate for the consumption of inventory space, you now have two additional pages of inventory, giving you 80 extra slots. Weapons and enemies now deal elemental damage, which has a chance to inflict elemental status ailments - powerful combat-related debuffs. I have also added an item system to upgrade weapons. It primarily serves as an item sink, since in a modded playthrough, it is very common for the player to have more weapons than needed. The upgrade system gambles your weapon at a risk of destruction and at a cost. Rare upgrade crowns make this process less painful and protect weapons you hold dear. Special thanks goes to raydeejay, Mirsario, jopojelly and bluemagic123 for helping me fix bugs during the mods development. I want to thank also Mirsario, Alena, HellPhoenix, Jofairden, NuovaPrime, Snorlaxxo, Hozlocos, Mop Guy, Randie Marsh, and Robbie for being my beta testers and for helping me stay motivated. Art and code was made by me, but I would like to credit the tModLoader dev team with making that possible in the first place. If I have forgotten anybody from this list, I sincerely apologize. Please inform me and I will correct it asap. The mod is open source. The source code can be acquired by three means: Going to the github page here, or by using ModLoader to decompile it, or by using ILSpy. Any of my content may be used, but please give proper attribution (credits) and if using a larger part of my mod (such as a major mechanic), please refer people to the original. If you're unsure about anything, you may contact me through PM or in this thread. - Fixed a bug where NPCs would teleport in multiplayer. Another bug that causes them to ocasionally vanish persits. - Potency now provides less life leech and critical strike multiplier. - Ground enemies now move faster, making them more dangerous. - Mod is generally compatible with multiplayer, though there are still a few rough edges here and there. - Players now have short duration of immunity after their attacks are dodged. - Multiple projectiles from the same ability cannot hit the same enemy in quick succession. - Glyph modifier "Vanish" renamed to "Discord" and now works like the Rod of Discord, but also deals much more damage. Use with care. - Glyph modifier "Thorny Chains" now much more useful. - Heart Crystals now scale life via a percentage bonus. Life fruits do the same, as do Mana Crystals. Q: What are the current compatibility issues? A: The mod is incompatible with multiplayer, Magic Storage, Autotrash, unleveled and unlimited. The first three will be fixed with next update, and possibly the latter two as well. A: Yes, and they go along together extremely well. I highly recommend playing with both enabled. A: Using Overhaul's beta, yes, courtesy mostly of Mirsario who helped me add compatibility and made the needed changes to his own mod. It is recommended however that you disable durability in Overhaul’s settings, as the repair UI overlaps with my inventory rework. A: I haven't tested them together, but it should be fine. A: As with Thorium, I haven't tested them together, but I think they will be compatible. A: Yes, but Tremor Mod has very powerful enemies early game, which results in too powerful weapon drops and too much XP gain. A: Yes, though it has the same issue as Tremor but to a much lesser extent. A: Eventually, I hope to, yes. A: Upgrade Crowns never enter the inventory, but can be found in the Anvil GUI. A: I'm working on this project mostly by myself andI have a lot of other projects going, but I’m also a bit of a noob. Q: The additional inventory pages are impractical! Plz remov. A: Go to your ModLoader directory “Documents/My Games/Terraria/ModLoader” and open the file called kRPG_Settings, and set “manualInventory” to true, then restart Terraria. Might add an ingame configuration menu if there’s public demand for it. The mod also has a patreon, for those who are feeling generous. The mod has a discord server at https://discord.gg/zcywzYR. Please be friendly and observe the rules found in the information channel. There is also a closed discord server for testing new updates as they are being developed. PM me if you're interested in being a tester. Yuyutsu, Farkylk | Silvan, Joop and 25 others like this. JamCatPlexer, Nordblum and Kalciphoz like this. Wow. This looks really nice. How long has this been in development? The interface looks very well polished! Kudos for that. Did you hit any bumps on the way to proper damage scaling on enemies? Projectiles seem particularly tricky. Open source, huh? I haven't seen an rpg mod go open source before, so that's pretty neat. I would do it for my mod, but I wouldn' be able to take the ridicule for my coding style and bad practices. As a fellow rpg mod dev, I'd love to see how this will go. Best of luck to you! DontEatSocks, Lunatic Lobbyist and Kalciphoz like this. Been in development for 17 months, but I've been taking breaks during that time, so counting only the time I actively worked on it I think it'd be closer to 9 months or so. Projectile scaling was not obvious, since just changing the damage of NPCs wouldn't do it. What I ended up doing was handling the damage scaling at the receiving end, which is also not perfect but probably the best solution. TheTitanGiant, A Person 2 and Lunatic Lobbyist like this. Yeah, I've been thinking about that. It's currently a medium priority I think. This looks great, I fully support and hope this goes somewhere. Lunatic Lobbyist and Kalciphoz like this. Kojiro_S and ShadowTiger like this. Zerxex123 and Lunatic Lobbyist like this. Looks better than any other RPG mod i've seen already. MugetsuYarida, Lunatic Lobbyist and Kalciphoz like this. Finally, gratz to your realese i remember when i saw your first screenshots of the UI you worked on several months ago was woundering if the mod is still alive but there it is. Gonna test it out in a bit but before that some things i already noticed. First of all You combine several other mods into one which is good i like everything in 1 Place but some drawbacks are there. The New UI as much as it looks neat and Fancy in terms of dynamic is Leveled together with Unleveled ahead since you can change the UI how you like it with several options that mostly fit quite well with the game also the UI you cant edit for the Stats and all that kind of stuff blends quite well into the game. Your UI seems like a lot of work and is something new but also seems totally off. The New Inventory Space seems pretty neat i always wanted something to upgrade ur inventory over the progress of the game since early game exploration is a mess with such small space and drives me nuts. Rartrin already had something like inventory expanding but nothig to realese yet, as @Moon_Man suggested having Inventory expanding mod seperatly from this mod would be really kewl for non KRPG Playthroughts i know you workon alot other projects but maybe you find the time to make that in the future afte rpolishing out KRPG. I also like the Support for such mod like Calamity since it can result in alot of unbalance frustration when using any RPG mod with Endgame stuff like Calamity. I also see you mention Tremor and Spirit mod but didnt mentioned Thorium mod, any special reasons ? Well basicly thats for it now i will test around with the mod and may change some statements from the above or add new ones after i fiddel around with the config file and the game + other mods i report back with the results. Best Regards and Good Luck for now. I am using the Mouse Text font for the interface. I use Item Stack font for the buttons in the upgrading interface and I use Combat Text for XP and healing. I forgot to mention Thorium mod, but will do so now. Thanks for reminding me. This looks amazing, I'll have to try it out! I am currently using leveled mod and using your mod plus leveled your mod fights for hp and mana control. You could always add a way to disable (RPG Stats Element) cause I enjoy elemental damage and drops but not that Leveled mod and your mod fight for control over health systems and mana systems.